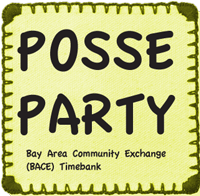 Come by any time from 4 PM to 8 PM and participate in our potluck, skill-shares, and gift circles. Your little ones will be expertly attended by experienced volunteers whenever you need a break. We will also have a skill-share geared for younger participants. If you will need childcare, feel free to call Amber at 415-699-7011, so we can arrange to have enough volunteers and age-appropriate activities. You can also email her at adyada@yahoo.com. Power to the babies, kids, and grown folks!